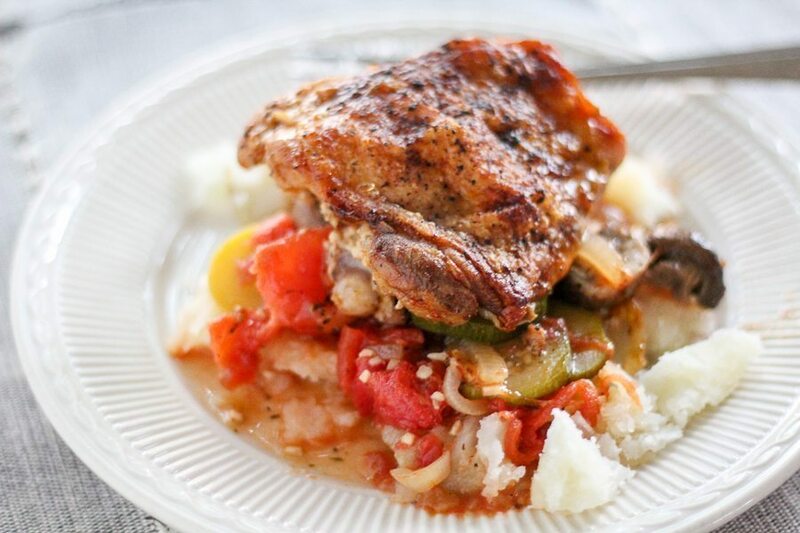 In the event you are ever at a total loss of what to cook, remember Country Chicken Cacciatore Recipe. 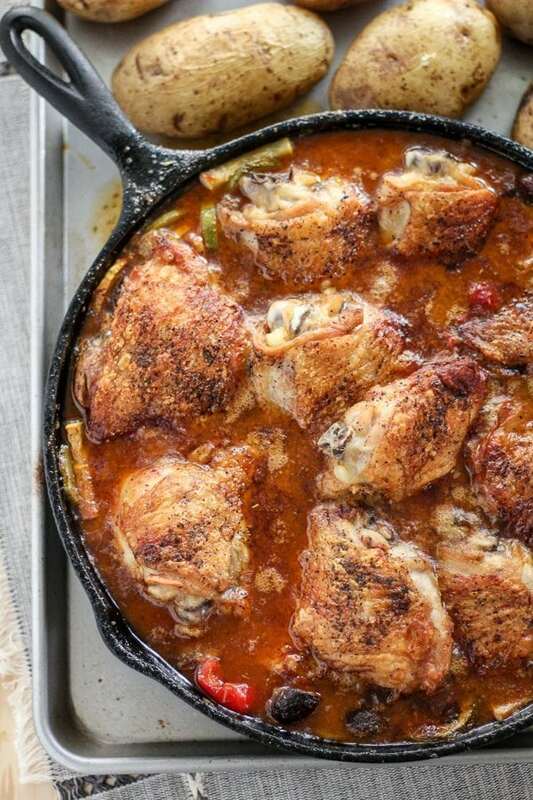 This one pan recipe hits all the yummy high notes. Golden brown chicken thighs are cooked until the skin is crispy, but tender and moist on the inside. Country garden vegetables like fresh zucchini and summer squash, tomatoes, and white wine create a flavorful stew that is amazing. You ever work on a recipe and just know deep-down in your heart of hearts that it is going to be good? 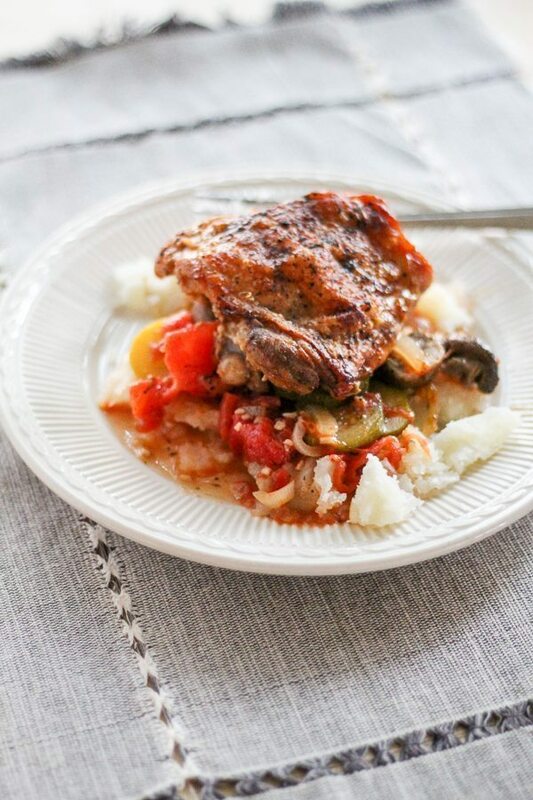 From start to finish, that’s the feeling I had about this Country Chicken Cacciatore Recipe. One of the reasons it turned out so delicious? I kept this chicken cacciatore recipe simple. Simple ingredients, easy to find vegetables, and basic seasonings come together in this one-pan chicken recipe that will knock your socks off. The rustic sauce is a blend of country vegetables. 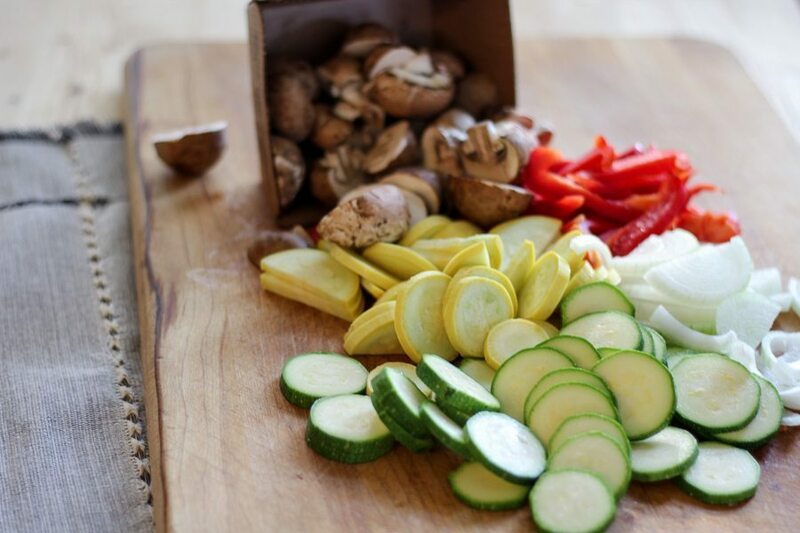 We used fresh zucchini, yellow summer squash, sweet red bell pepper, baby portabella mushrooms and yellow onion. Pick your favorite vegetables to make this sauce. I think this chicken cacciatore recipe would be great with fresh green beans, eggplant, or carrots. 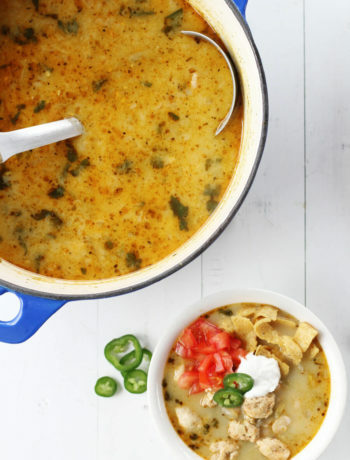 Click Here for **13 Easy Chicken Recipes** to Make Your Life Yummier! To really highlight the vegetable flavor, we seasoned our sauce with stewed tomatoes, minced garlic, a generous amount of dry white wine, and 4 basic spices. Tip: Pick a good quality, great tasting wine. If you wouldn’t drink it, you probably shouldn’t cook with it. Bay leaf, Italian Seasoning, salt and pepper. That’s it. Why overpower a perfect dish with too much spice? Be sure to scrape the yummy brown chicken flavor from the bottom of the skillet when you pour in the wine and tomatoes. That is where all the chicken flavor is at. Place the golden brown chicken on top of the vegetable and tomato sauce and pop it all into the oven. Don’t cover the chicken with sauce. You want the chicken thighs to rest right on top. Your cooking time will vary based on your oven and how big your chicken thighs are. 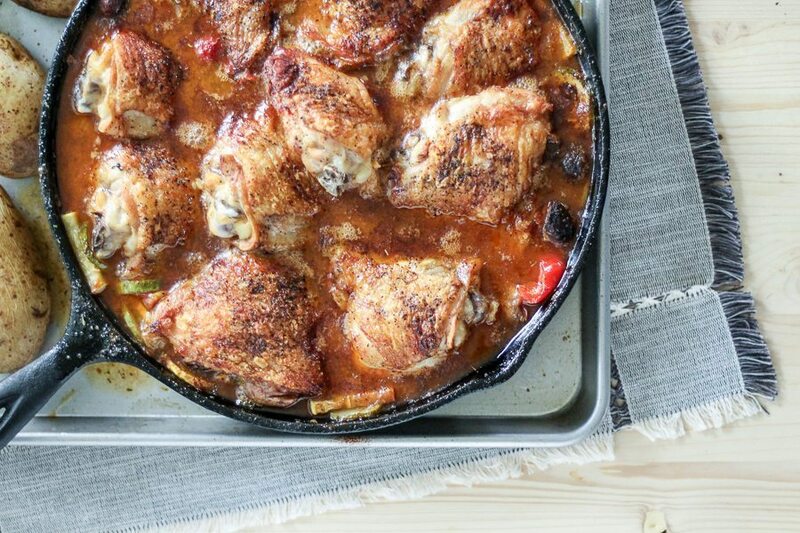 We baked our Country Chicken Cacciatore for about 40 minutes, then let it rest for 10-15 minutes. 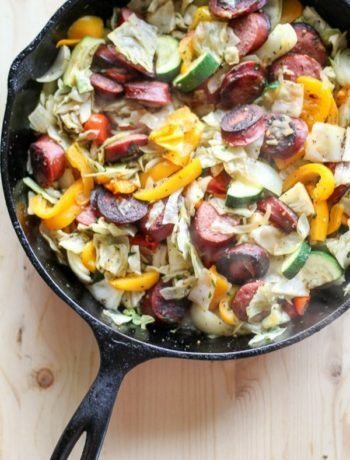 Such a gorgeous skillet full of food, don’t you think? 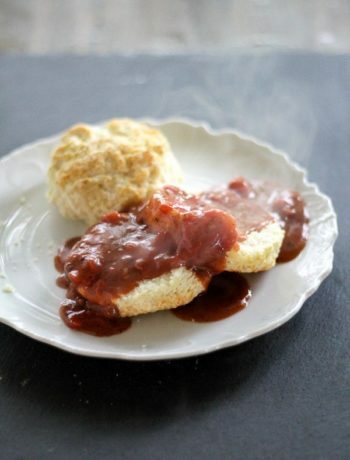 A recipe so simple, but delicious enough to be served to guests. Most chicken cacciatore recipes are served over hot pasta, egg noodles or rice, but we went with a baked potato. Use anything you would like…the rich vegetable stew will make it taste like a million bucks. Major time-saving idea: Wash and scrub small baking potatoes, and lightly coat with oil. Place them on a heavy-duty baking sheet next to the chicken cacciatore skillet. 1-you have a side dish to serve with your meal. 2-the baking sheet will catch any bubble over from the cacciatore. Look at this beautiful plate of Country Chicken Cacciatore! Make this one pan recipe at home. You won’t regret it. Golden brown chicken thighs are cooked until the skin is crispy, but tender and moist on the inside. Country garden vegetables like fresh zucchini and summer squash, tomatoes, and white wine create a flavorful stew that is amazing. In a large cast iron skillet or dutch oven, heat the olive oil to medium high. 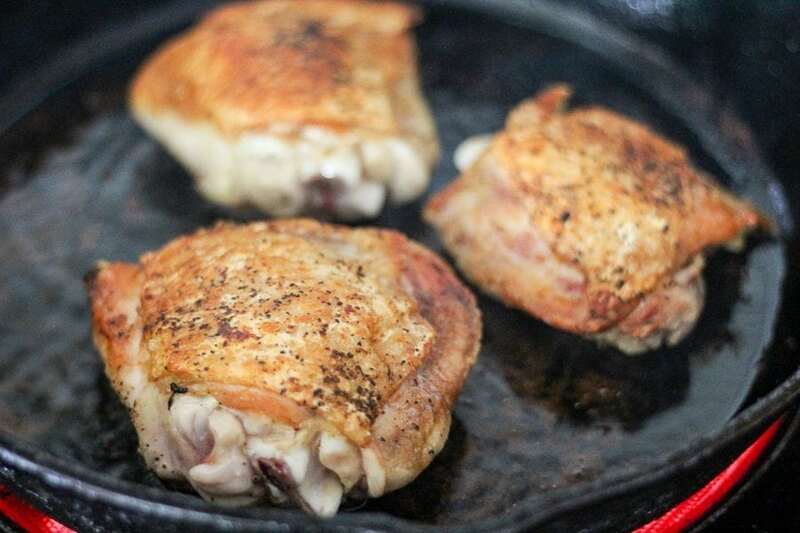 Trim excess fat from the chicken thighs, but leave the skin on. Sprinkle both sides of the chicken with salt and pepper. Working in batches, brown the chicken in the oil. Start skin side down, rotating and turning until the chicken is golden on both sides. Set aside. Continue until all chicken is browned. Pour out the excess chicken cooking grease, reserving 1/4 cup in the pan. Reduce heat to medium. 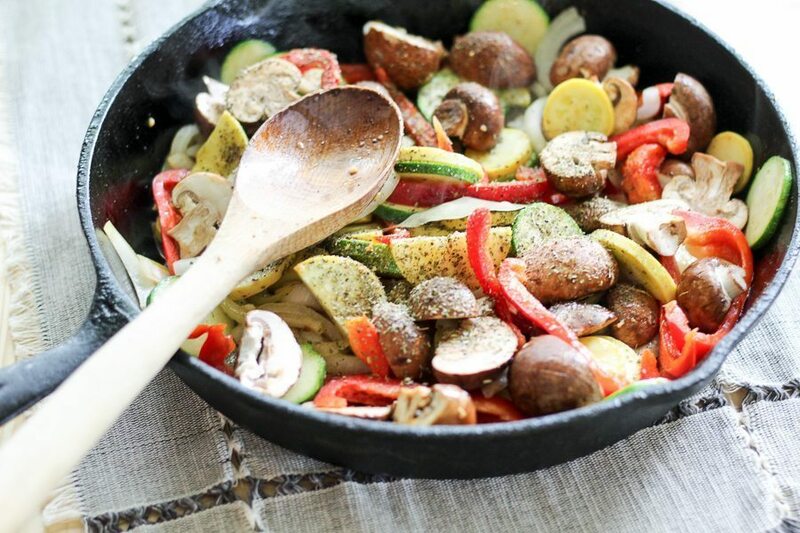 Add the zucchini, summer squash, mushrooms, bell pepper, onion and garlic to the pan. Stir to combine. Add half of the wine and scrape the brown bits from the bottom of the pan. Add the stewed tomatoes, the remaining wine, half a cup of reserved tomato juice, Italian seasoning, salt, pepper, and bay leaf. Stir to combin well. Place the browned chicken breasts on top of the tomato and vegetable mixture. Transfer the skillet into the center oven rack and bake uncovered for 45 minutes. Serve over hot potatoes, rice, or pasta.